RUMFORD, Rhode Island (August 12, 2016) – For Norman Xiong, it was a dazzling debut, and for Lucy Li, the second time was the charm. 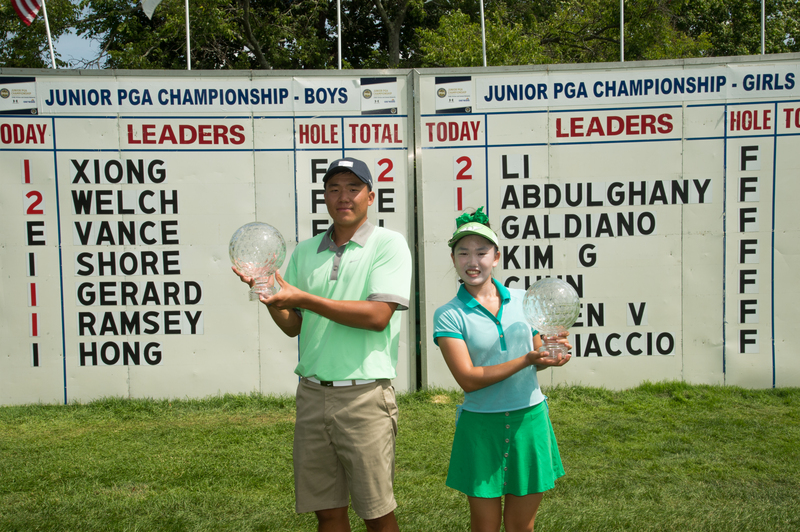 Both claimed victories at the 41st Junior PGA Championship presented by Under Armour and Genesis Networks, which was contested this week at Wannamoisett Country Club, and cemented spots in next month’s Junior Ryder Cup. Xiong, who hails from Canyon Lake, California, won his Junior PGA Championship debut by two strokes over Patrick Welch, of Providence, Rhode Island. The victory assured Xiong and Welch of berths on the U.S. Junior Ryder Cup team, which will square off against their junior counterparts from Europe, Sept. 26-27 at Interlachen Country Club in Edina, Minnesota. Xiong’s 2-under, four-day total of 274 was remarkable considering he was under the weather for most of the week. Add to that a dose of oppressive humidity, wet/soggy conditions on Wednesday, week-long breezy conditions on Donald Ross’ revered par-69 Wannamoisett, and Xiong’s hoisting of the Jack Nicklaus Trophy is all the more impressive. One-under after 54 holes, Xiong led by a single shot over Davis Shore of Knoxville, Tennessee. In all, 12 players were within four shots and in hot pursuit. Xiong started Friday strong, carding three birdies on the front side. A bogey on No. 7 was his first blemish in 17 holes dating to Thursday’s third round. Along the way, Xiong thwarted various charges by the hometown favorite, Welch (even-par, 276) and Shore (third place, one-over par, 277). Nursing a one-shot advantage, Xiong’s successful 15-footer for birdie on the par-5 17th provided needed breathing room, and his par on 18, the cherished victory. On the Girls’ side, Mariel Galdiano of Pearl City, Hawaii led after 18 and 36 holes and appeared to be cruising early Friday. With five straight pars to start the morning, her lead reached four shots. Then came a troubling bogey-double-double sequence on holes 6-8. A birdie at 9 stopped the bleeding, but the damage was done. Meanwhile, two groups ahead, Li posted birdies on 5, 7 and 8 to grab a share of the top spot. Li’s inward nine was as steady as it was Championship worthy. Five consecutive pars set the stage for a shiny birdie on the 135-yard par-3 15th hole. That gave the Redwood, California native a two-shot cushion on Galdiano, who bogeyed 13, and Youngin Chun of Gainesville, Florida, who bogeyed No. 14. A poor chip from Li on the 72nd hole rendered a bogey and left the door open for Galdiano, who could force a playoff with a birdie on either the difficult par-5 17th or the par-4 18th. Back-to-back 5s, however, cemented a final-round 77 and capped Galdiano’s lost day. Her incredible junior career, which included three Hawaii state high school golf championships, a trio of berths in the U.S. Women’s Open and a spot in the 2016 Curtis Cup, could not be sullied by a poor round. Galdiano will report to Westwood and begin her collegiate golf career at UCLA later this month. When Li woke up this morning, she didn’t see this coming. Although Li’s scorecard told a different story, her 2-under 69 was the low round of the day in the Girls’ Division, she was not overly impressed with her own play. With her win, Li gained three new Junior Ryder Cup teammates: Alyaa Abdulghany of Newport Beach, California, Xiong and Welch.